Discussion in 'Pro Wrestling Discussion' started by revoltub, Aug 12, 2016.
im surprised wwe hasnt done this yet. Im sure it was discussed, maybe too hard hitting for some of the fans? SocraticMethod, Pen is mightier, Falsedawn and 3 others like this. And weren't The Shield reminiscent of that as well? Those days of characters relating to news stories are done and over with. Think of what happened when they tried Muhammad Hassan? With tensions how they are today and the pg era, it's not gonna happen. 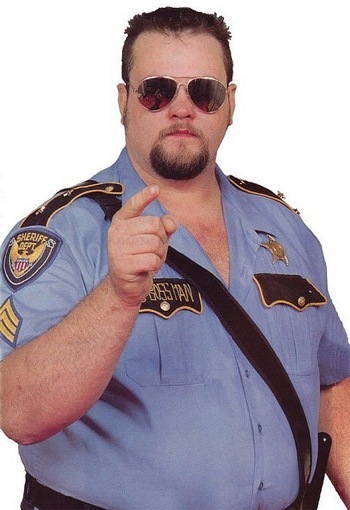 Would a racist cop gimmick be a heel or face? Pen is mightier likes this. If you wanna be socially relevant, he's obviously gotta "kill" an unarmed member of the New Day. Two birds with one stone, black and gay outrage. It may be too late to turn Cena now. His clock is winding down and it's not really a move you want to see pulled while he's stepping out the door. That was the exact reasoning for turning Hogan. Difference is Hogan wasn't going anywhere. If Cena's looking to be a poor man's Rock and be a pop culture icon who occasionally ducks back into wrestling, then ditching the Make-A-Wish and other charities (a big thing for him personally) and the T-shirt sales that keep him on top (and the difference unlikely to be made up by smark buys) isn't a great move. Cena will go out on his babyface shield and he (and the E) will be able to milk the nostalgia everything they do a throwback Raw. Cena would be believable as a police officer. If they said John has recently taken the test as a police officer everyone would by it. They could have Shaq bring him on board. Quick question.....if we post in this thread about this proposed character......are we actually accepting that cops are racist? Won't fly with some folks here. Cena could be a tweener with a gimmick where he gives kids steroid injections. A prison guard is not a cop.